Septembre 1992, Dan O’BRIEN broke the Decathlon world record in Talence, in the “Thouars Stadium” with 8891 points! Earlier in the year, for the US Olympic trials he failed his 3 attemps in the pole vault and missed his chances to qualify for the Barcelona Olympic Games and his chances for the gold medal. Looking for a revenge, he announced his participation to the Decastar, and wished to break the world record. Talence and the Decastar meeting made the history. September 2018, the Thouars Stadium is once again the theater of a great success ! 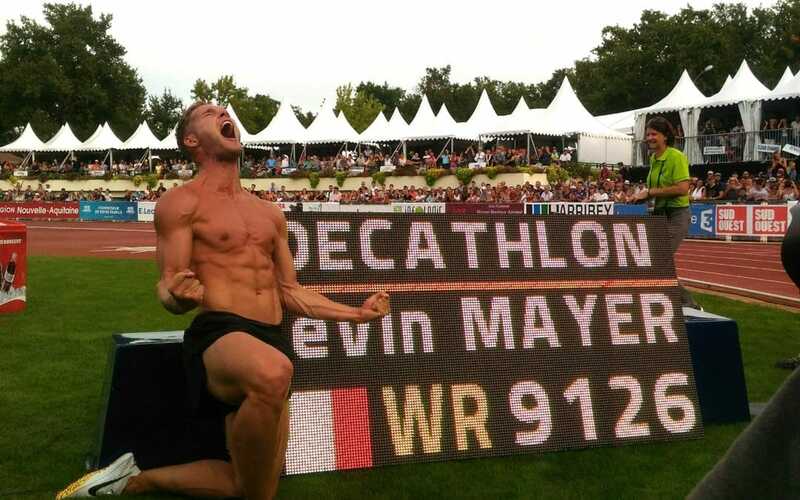 Kevin MAYER became the new world record holder by scoring 9126 points, beating the previous world record from Ashton EATON realized in 2015. After his disappointment in Berlin, Kevin, during the 2 days of the Decastar, pushed the decathlon limits, by winning 7 events out of 10 (100m, long jump, shot put, 110m hurdles, discus throw, pole vault and javelin). Rare fact, he scored the same amount of points the Saturday and the Sunday : 4563 points. Furthermore it’s the best total for a second day in the history of the decathlon. In great shape all year long, he confirmed in Talence, by breaking several personal record : 100m 10’’55, long jump 7m80 15cm better than his previous record, and smashing his javelin record with 71m90. He closed this crazy week-end by setting a new world record with 9126 points (81 points more than Ashton EATON). He is the third men to go over 9000 points. This edition has forever marked the hearts of spectators, sponsors, medias, volunteers, athletes and organizers. Thanks to the 12 hours of direct live, this success was broadcasted all over the world. By asserting himself in the discipline, Kevin MAYER intend to promote the Combined Events. The Decastar has just written the second big page of its history !